Martinwood Cabinetry products typically provide as much as 20% more usable storage space, with up to 3% more width in each and every drawer than a traditional face frame cabinet, which is the reason we like to say our fine European cabinetry embodies the very essence of form meeting function. The interiors are produced using moisture- and chemical-resistant engineered wood core panels with a thermally fused melamine coating that is stable and void free (UV coated veneer core plywood also available upon request). Melamine surfaces are not only durable, but also cost effective, which allows us to put your money where you see it. Every step of the True32 manufacturing process � from computer-assisted design to state-of-the-art processing equipment � leads to unsurpassed precision and durability you can count on. 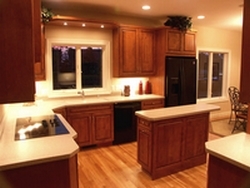 We specialize in creating custom cabinetry to fit not only your home, but also to fit your needs and taste. Unlike pre-manufactured home center cabinets, Martinwood Cabinetry products seek to meet your lifestyle with beauty, grace, and value, while avoiding fads and the pressure to produce the next in thing that will ultimately be the next out thing. We prefer to pursue our designs with an appreciation of the past, integrating architectural and structural elements that have stood the test of time � designs that balance form and function. Choose from an exquisite palette of natural woods, door styles and fashion finishes, and be assured that the hardware and accessories used in any Martinwood Cabinetry project will be of the highest quality available. Together we can create your dream design that is not only comfortable to work in, but also beautiful, elegant, and possesses a style that will endure the test of time.